You can enjoy various experiences and activities around Nagoya. Are you looking for particular things to buy and take home? Our guides can help you to find where they are available. 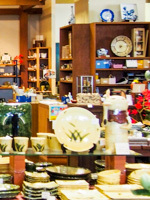 Nagoya is surrounded by major production areas of pottery such as Seto, Tajimi, Tokoname, Yokkaichi (Banko) and Shigaraki. 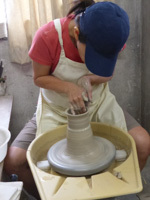 There are many opportunities to shop pottery. Seto is the country's leading production area of ceramic and porcelain with a long history, that in Japan people generally call pottery as "Seto-mono". Even today, there are many studios which keep on creating various art pieces. Have a relaxing moment in this historical town and look for your favorite pottery in several ceramic shops. Seki, a town known for the manufacture of cutlery, is located in south-central Gifu Prefecture. It inherits the tradition of swordsmith techniques that started in Kamakura period (12-14th centuries). During the Sengoku period (16th century), "Magoroku Kanemoto II" succeeded in forming a robust sword by applying unique swordsmith techniques. The brilliant traditional method was passed down to younger generations, thus today Seki has become a well-known production site of knives and blades. There are some ideal places to find souvenirs for your family, friends and yourself. 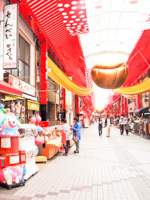 During the Nagoya Castle and highlights in Nagoya City Tour, you can visit Sakae Shopping district and Osu Shopping Street. 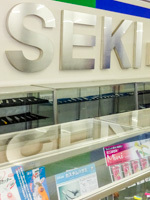 In Sakae, you can buy modern Japanese products such as gourmets and cosmetics. In Osu, you can find more traditional objects such as second-hand kimono, imitation samurai swords, etc.